Sweet Tamara and Her Lemon Tamale! | Delicious! Delicious! Sweet Tamara and Her Lemon Tamale! The aisles are crowded with CUSTOMERS rudely shoving their carts past one another. It is a mad house, and it’s not even Saturday. In one of the endless book aisles, one WOMAN tosses a cookbook aside and continues on her way. She bumps Caryn with her cart as she passes but does not apologize. Caryn wakes from her cookbook reverie and checks her watch. She peels her loaded cart into a checkout lane behind PATRICK DUFFY, wearing a handsome Hawaiian shirt and clogs. Caryn rolls the cart outside and glances toward the snack bar line, which is easily twenty deep. After checking her watch again, she sadly heads into the parking lot. Caryn is on her way when something catches the corner of her eye. She immediately spins the car into an illegal u-turn. The few tables in the small, but colorful restaurant are filled with satisfied PATRONS. Caryn heads straight to the counter where a YOUNG MAN smiles warmly at her. She stares at the chalkboard behind him. I’ll take one Calabazita, one Spinach-Mushroom, one Jalapeno Cheese and…which chicken one do you like best? The man turns around to look at the board. Um, Chicken Verde. No! Family Chicken. I’ll take one of those. And two Lemon. No, one Lemon, one Cinnamon Sugar. He makes final notes on the paper and takes it to the cash register. Wait, just make that three Lemon. He pauses for a second to make sure she’s done. Caryn smiles sheepishly and he finishes ringing up the order before heading to the back. Off to the side, another OLDER MAN is stuffing some fresh masa into a corn husk. King Crab shells are piled next to him. Caryn looks at the board again to reconsider, but it’s too late. The young man returns with her order, packaged in little brown boxes. Caryn sits at a red light and eyes the boxes next to her. She gives in too easily. 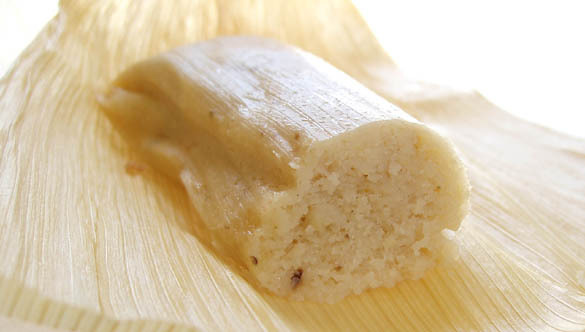 As the light changes, she grabs one with a sticker on the plastic that reads, “Lemon.” She carefully unwraps the warm tamale while attempting to steer. Another red light. Caryn seizes her opportunity to bite into the fragrant, barely-sweet tamale. She is not disappointed. The Calabazita tamale has zucchini, tomatoes, onion, garlic, white corn, and jack cheese. The Family Chicken tamale has chicken, tomato, potato, zucchini, green chile, olive, and raisins. Tamara has over thirty tasty creations from which to choose. Shipping within the U.S. is available. More Mr. R and Miss A! More Caryn! More, more! Great story so far, I’m LITERALLY hangin’ on the edge of my seat here… honest:) I checked 3 times yesterday;) Keep up the great work, and tasty recipes and restaurant ideas:) Great blog! Oh my g-d I want one of those! Glad to see those Tamales. I was about to break out in zits from just seeing those brownies, boy do they look delicious! delicious! Had to wipe the drool off my keyboard. Yummmmmm. Amy, certainly you make a trip to LA every now and then. Bring some home! Thanks, ADeli. They were good.